Featuring Dolores Huerta, Curtis Acosta, Barbara Carrasco, Camila Chavez, Juana Chavez, Maria Elena Chavez, Ricardo S. Chavez, Hillary Clinton, Angela Davis, Lori de Leon, Wendy Greenfeld, Raul M. Grijalva, Ramona Holguin, Emilio Huerta, Roberto Lovato, Eloy Martinez, Eliseo Medina, Nancy Pelosi, Rick Rivas, Randy Shaw, Gloria Steinem, Art Torres and Luis Valdez. Written by Jessica Congdon and Peter Bratt. Distributed PBS Films. 95 minutes. Not Rated. I had never heard of Dolores Huerta. I was a decent student, but that was a long time ago, and it’s been a while since I’ve read my American History. I remember talking about the 60’s – the hippies, the drugs, the protests against the war. And I never heard or read about Dolores Huerta. While I don’t believe she was removed from my school’s curriculum (as she and “ethnic” studies have been removed from the Texas and Arizona curriculum), I think any mention of her was as a footnote to an already brief mention of Cesar Chavez and HIS work organizing farm workers in California. At a time where American immigration policy, civil rights, sexism and racism are at the forefront of our daily lives, where our present and future seems to be in peril, it is easy to become desensitized and disheartened. It is easy to feel like we are angrier and more frustrated than we have ever been as a nation. We need only look back to our history to know that we’ve been here before. If we don’t learn from the struggles and lessons of leaders like Dolores Huerta, we will be here again. We need to read and watch and learn about our nation’s history now more than ever. I can think of no better way to start then by watching this vivid documentary about this dynamic, selfless leader. The documentary flows back and forth through our history, using current interviews and news footage from the era: Dolores and Cesar; Dolores and Robert Kennedy; Dolores speaking and working to fight for the basic civil rights of the farm workers, at the expense of her comfort and care of her 11 children. It paints the image of a selfless leader but at the same time, shows her pitfalls and maybe, regrets. As a mother, it is hard to imagine putting my work that far ahead of my family. The interviews with her grown children show the pain of their family’s sacrifice, along with the later respect and acceptance for the choices that she made. We learn early on that Dolores’ main passion, outside of her work, was jazz. It was the one regret that stood out to her as she dedicated her life to her work in her mid-20s. Her love of music is woven through the film as its own musical timeline, highlighting relevant jazz, rock and Latino music that were the pulse of the era. Dolores brings a perspective that many of us have never had to consider or imagine. 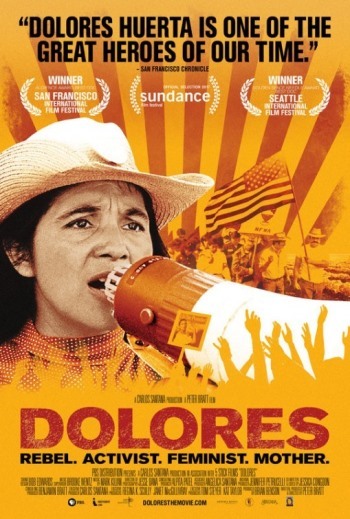 Dolores saw social injustice in her community and took a stand to fight for the basic civil rights of the farm worker – access to toilets, safe drinking water while working all day in the sun and the right to a safe workplace free of the risk of direct exposure to cancer causing pesticides. Dolores did not set out to be a pioneering feminist and role model for young Latina women, but through her leadership and example, that is what she has become. Honestly, I feel thankful and even inspired after watching this powerful documentary and suspect I will be watching it again. Thank you, Dolores, for sharing your story. Dolores opens tonight at the Ritz Five Movie Theater Philadelphia. On September 16th, Dolores Huerta will be at the Ritz, in person, performing a Q&A after the 7pm showing. Tags: Bonnie Paul, Cesar Chavez, Dolores, Dolores Huerta, family, farm workers, history, immigrants, Jazz, Labor, latina, movie review, National Farm Workers Association, personal appearance, philadelphia, PopEntertainment.com, Q&A, Ritz Five, Robert F. Kennedy, union, United Farm Workers. Bookmark the permalink.